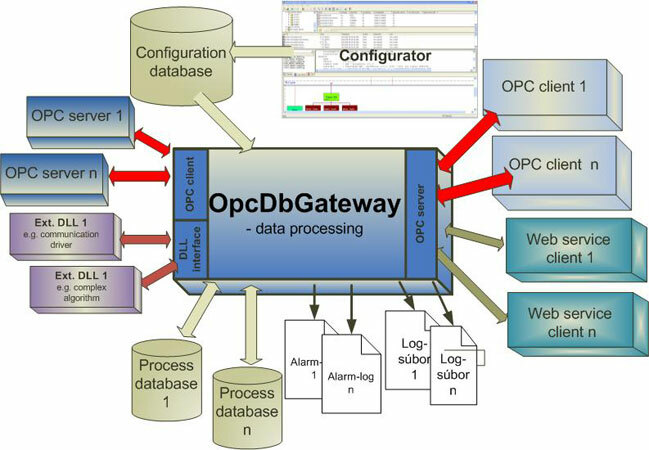 Configuring and running of data exchange between various sources - OPC servers, OPC client applications, device communication drivers, monitoring, storing into process databases, trends, alarms, logging, reports, periodical or single-shot launching of external programs and scripts at specified time, executing of SQL commands for data manipulation in process databases, integrating to SOA using OPC XML DA, OPC UA, integrating of external DLL. Creating of applications preferably by configuring enables high productivity enhanced also with using of various debugging tools and wizards for special function as e.g. historical trends and the address space import import of the external OPC servers. It can be used also for: OPC tunnelling, OPC redundancy, OPC to mail, SMS and in the SOA systems. Qweas is providing links to OpcDbGateway 4.00.00 as a courtesy, and makes no representations regarding OpcDbGateway or any other applications or any information related thereto. Any questions, complaints or claims regarding this application OpcDbGateway 4.00.00 must be directed to the appropriate software vendor. You may click the publisher link of OpcDbGateway on the top of this page to get more details about the vendor.